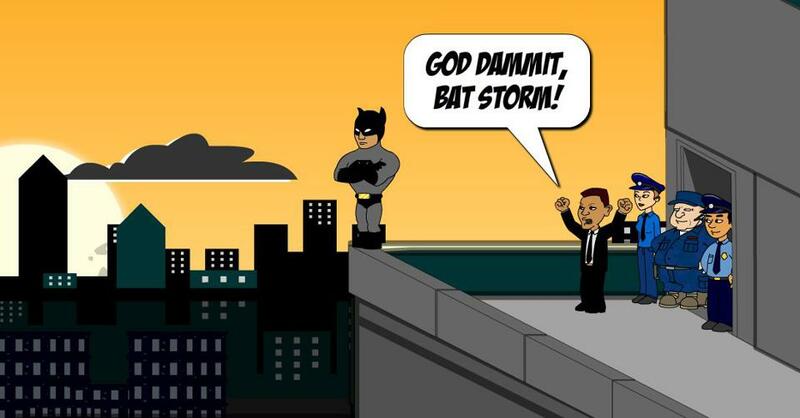 It's been approximately two years since I completed Bat Storm, Episode 1: Financial Crisis and finally the first part of Episode 2 is here. 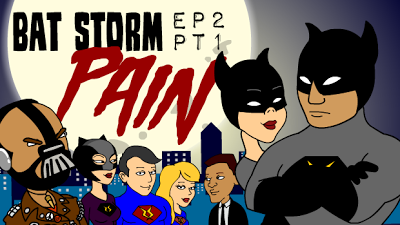 Bat Storm, Episode 2: Pain, continues from Episode 1. Super Charge is still undermining Bat Storm's efforts to fight crime and Detective Smith is still unhappy with any Superhero doing police work. Impressed by the Jokester's business model of look-a-like employees Bat Storm has started to expand his party appearance business with new look-a-like employees of his own. Meanwhile the Mayor's office has experienced several attempted break ins by a masked thief and Bat Storm takes it upon himself to apprehend the repeat offender. Behind the scenes, I never intended to take this long to release Episode 2. In fact the original intention of the Bat Storm series was to write and release each episode quickly, within weeks of each other, until I had completed a series of six 24 minute episodes (each episode broken in 4 parts, 6 minutes each). However things change, and at this stage I'm not sure if I'll complete all six episodes. My animation goals are much different to what they were 2-3 years ago, when I first conceived Bat Storm. Episode 2, Part 1 is obviously scaled back from some of the grand ideas I experimented with, such as photographic and panoramic backgrounds. There no custom flash work here that you haven't seen before in either Episode 1 or one of my promotional videos for Episode 2. I've already written quite a bit about the behind the scenes stuff that delayed this episode when I prematurely announced Episode 2 as coming soon around June of 2012. What finally got me moving at rapid pace again was a refocus on the script. I pretty much trashed everything (except the script) I'd done in my first attempt to get things moving. Proven by the fact that the roof top scene that I released from my original start (see image below) looks very different in the version in the animation I released. first version of this scene that I scrapped. The roof top scene is key to getting things moving again as the version that ended up in the animation contains a lot more ideas than what's written in the original script. For example in the original version, Bat Storm doesn't get startled, doesn't fall off the ledge and Super Charge is not in the scene at all. It was this flood of ideas for the opening scene that helped keep my momentum going and a recommittment to keeping things simple and not over dressing scenes with unnecessary detail. From the opening Bat Storm titles the rest of part 1 is pretty much the script, as I wrote it in 2011, with a few minor tweaks here and there. Oh... and a complete change of one character. You may have noticed a Cat Woman like character (whose actual name is 'Thunder Kitty' - thanks to GoAnimator, gipsy for the name). Originally her role was going to be played by a male character called 'Red Claw' who, in a very early script idea - prior to the 2011 script, was Thunder Kitty's body guard. In making the animation it became immediately obvious that breaking into the Mayor's office is a very Cat Woman like task, so instead of using my Red Claw character, Thunder Kitty takes his place. Finally, in case you're wondering, the Bane-like character is actually called 'Pain'. Tom Pain of Painless Gardens and Landscaping. That's it for now. I'll be making a start on Part 2 as soon as I can now that my motivation is high. There's no script holding me back so I'm completely free to explore ideas as I go. Just like I did for Episode 1.